ProZone has developed a programme designed for New Zealand and Australia with local foods, weights and measures. The ProZone programme simplifies and demystifies the Zone and because we know that the Zone works we promise never to charge our seminar and starter pack clients for any further advice or repeat visits for help, support and advice to achieve their goals. One off cost $450 or $499 for a couple or family. A couple or family is two people who live together and so require just one book and one Block Builder between them. The consultation normally takes about one to one and a half hours. Pay only once for your eating plan for life. Guarantee of ongoing free help, support and advice. Contact Carol by email (carol@prozone.co.nz) or feel free to phone on 021 215 8346 or call in to see me at Level 7, 22 Panama Street, Wellington. There are no meals to buy, weigh-ins or paying for weekly meetings. The main advantage of our private consultations is that they are designed to suit you personally, answer your questions, explain food facts as much as you want to the depth that you want and of course work with food ideas that suit you. As a fully qualified Zone instructor Carol will take you step-by-step thorough Zone Nutrition explaining exactly how the diet uses scientific principles and incorporates elements of well-known programmes such as the low GI and GL diets and the Mediterranean diet for health, wellbeing and weight control. Carol has a background as Registered Medical Laboratory Scientist with 33 years experience in Medical Laboratory Science. This means she is comfortable explaining and talking about scientific concepts in simple terms. A private consultation is the best way to get into the Zone. You will learn about the different food groups and how to balance them in a fun and easy to follow way. We explain a whole new outlook on food and how, by making often simple but significant adjustments to what you eat and how you eat it, you can reap tremendous rewards in weight loss, health, and wellbeing. At your private consultation we simplify your healthy eating lifestyle with practical suggestions on quick easy meals and snacks, economy, family meals, eating out, taking lunch, buying lunch. You get the private consultation, the ProZone book which is loaded with recipes, facts, tips and ideas, a shopping list and meal planner to help with your enjoyable healthy Zone eating lifestyle plus our Block Builder® that shows you how to select the best food choices in the right balance and right amount for every meal and snack and we calculate your personalised food requirements. We guarantee friendly personal service that’s tailored to your specific needs. We’ll show you how to select the best foods for you and why. By re-educating and re-acquainting yourself with food, you will be able to get into and stay in the Zone. Of course there’s our guarantee of ongoing help, support and advice for free. Out of the Wellington area? Our Starter Packs are ideal to get you into the Zone and keep you there. You don’t have to miss the benefits of the Zone if you are unable to get to a ProZone Consultation. At ProZone we have designed Starter Packs for clients who cannot attend the seminars or live outside the Wellington area. These packs will get you into the Zone and as a ProZone Starter Pack client you are entitled to our guarantee of limitless free help, support and advice. And if you buy a ProZone Starter Pack you’ll automatically qualify for a free consultation with us that you can attend at a later date when you are in Wellington. N.B. Starter packs are only available to clients outside the Wellington area. What comes in the Starter packs? This is the essential item in the starter packs. The ProZone Block Builder® gives you an instant understanding of favourable and unfavourable food and balancing food in the Zone. You can prepare Zone balanced meals immediately with the help of your Block Builder®. Click here for more details about the ProZone Block Builder®. This DVD explains the basics of Zone Nutrition – how to use your ProZone Block Builder®, how to balance your food and prepare some simple balanced recipes. Produced and designed specifically for New Zealand and Australia, our DVD uses local weights and measures and commonly available supermarket food. Again written specifically for New Zealand and Australia with local weights and food items the ProZone seminar book contains a host of different recipes, food ideas and tips for a successful permanent Zone eating lifestyle. ProZone protein powder is ideal for the Zone nutrition programme because it is over 90% protein and just 1% carbohydrate and 1% fat. Its unique casein composition has a much lower insulin stimulating effect than whey protein and as it stays in the stomach longer its slow release is more satisfying for longer. Used to balance a wide variety of dishes, particularly at breakfast time or for snacks, this pleasant tasting protein powder is also useful in cooking. Why not sample delicious balanced smoothies, fruit ice creams, protein porridge, blueberry hot cakes, oatcakes etc? Omega-3 is a vitally important supplement for everybody. We strongly recommend the dynamic combination of Zone Nutrition plus Omega-3 fatty acids. Even if you choose not to supplement with fish oil, it is still a good idea to take Omega-3 for at least your first month in the Zone. We sell only SYW fish oil because it is highly concentrated and highly purified to remove PCBs and other toxins. Every batch of SYW fish oil is independently certified by IFOS to their 5 star standards for oxidation status strength and purity, a very important consideration given the pollution in our oceans. IFOS are the toughest standards in the world so you can take SYW fish oil with confidence. PureFit bars are a perfectly balanced bar for eating in the Zone. They are gluten free, non dairy, vegan and give you 18g of protein per bar. Each bar is two balanced blocks of protein, carbohydrate and fat. They make a tasty and satisfying lunch or snack and are handy to have in your bag, car or when travelling so you never need to be “out of the Zone”. Select a Starter Pack solution. 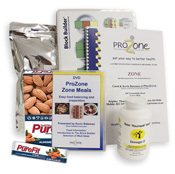 In the ProZone Regular Starter Pack you will receive calculations of your food requirements, the ProZone Block Builder®, the ProZone Series 2 menu driven DVD, the ProZone consultation book plus the ProZone guarantee of unlimited support free of charge. This pack is identical to the ProZone Regular Starter Pack plus it includes a pack of ProZoneProtein Powder. In the ProZone Delux Starter Pack you will receive the ProZone Block Builder®, the ProZone Series 2 menu driven DVD, the ProZone consultation book, a pack of ProZone protein powder, a box of 15 mixed PureFit bars and one 150 capsule bottle of SYW IFOS 5 star fish oil. *Post and packing for all packs are $10.00 all North Island and $12 South Island New Zealand. For Australia we pass on the current postage costs. Feel free to email us for these costs. Not sure what Starter Pack is best for you? (carol@prozone.co.nz) or phone (04 815 9165).